Last year we made our very first visit to Austin when we were a featured spotlight game at the super rad event Fantastic Arcade, part of Fantastic Fest, at The Highball. 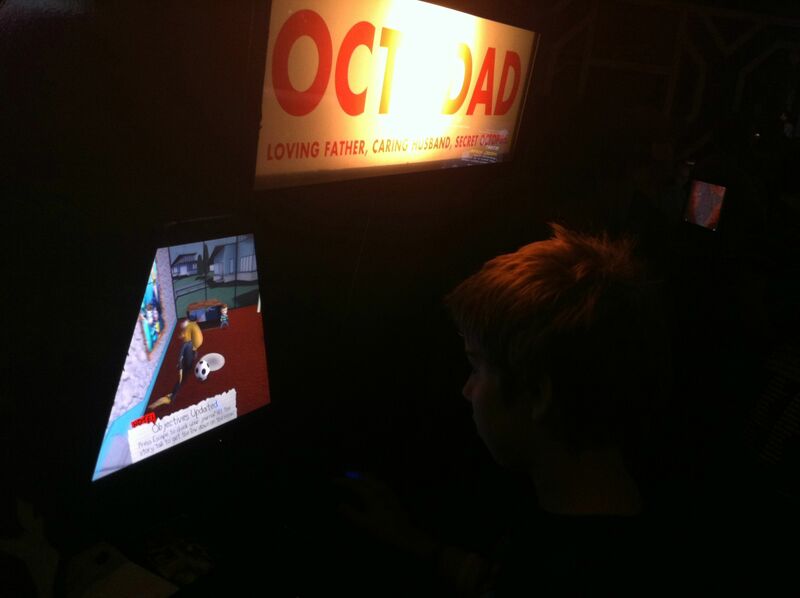 While there we showed off the first Octodad in a really interesting arcade machine setup. This year we may not be part of the spotlight, but Octodad: Dadliest Catch will be there and playable on all the showcase laptops for ya’ll to try out! FOR FREE! So if you’re in the Austin, TX area be sure to come by and play Dadliest Catch along with all of the other spectacular titles we’re showing with. Fantastic Arcade was more fun than GDC (for the most part). There I said it and I meant it. The thing that I thought was great about FA was its generally cozy atmosphere. Players came and went with no fuss or hurry that you might see at something like GDC. Lines for games were relatively short, people were friendly, and the tension was low. Everyone was at FA to enjoy the games, each other’s company, and the cool opportunity to speak with devs one on one about their projects. For the past month or so we’ve been sitting on the news that Octodad 1 was accepted into the Fantastic Arcade showcase. Now the bomb has been dropped from on high a top the Fantastic Fest news feed and we can share some cool things with you. Fantastic Arcade is a game festival which is still pretty new. Last year they featured games like Enviro-Bear 2000: Operation: Hibernation, FEIST, Monaco, Machinarium, Nidhogg, Braid, Canabalt, and many many others. We here at Young Horses feel so utterly and completely honored to be featured among the great titles in this year’s festival. We were lucky enough to be featured in the festival’s main competition where we’ll be sharing some arcade space with such monstrous titles as: Capsized, Faraway, Fez, FRACT, Jesus VS. Dinosaurs, Radical Fishing, and Skulls of the Shogun. There are also 13 other great games being featured at Fantastic arcade: Banker’s Dozen, Bit Pilot, Deep Sea, Dyad, Hohokum, Insanely Twisted Shadow Planet, Lost Mars, Murder Dog IV: Trial of the Murder Dog, Owlboy, Salome, Superbrothers: Sword & Sworcery EP, They Bleed Pixels, and last but not least Ute (A game for adults). Read more if you’d like to find out what we’ll be doing at the festival!